My last stop on this year’s 4-city China Drum-About was a city called Nanchang. It was my first visit here. Nanchang is a relatively smaller Chinese city with a population of only 5 million. That’s not much for a city in a country with a population of almost one and a half billion people. But that number translates into a lot less cars, traffic jams, a quieter China-style car-horn-street-symphony and a lot cleaner air than Beijing or Shanghai. As far back as the Ming Dynasty, this area has been famous as a producer of porcelain china. So everywhere you look there are huge beautiful porcelain vases sitting in front, and inside, of stores, temples, hotels and hotel rooms. Some of these vases are as tall as 10 feet high. Of the nine cities in China where I have taught at least one Playshop (or as many as six), Nanchang sits right in the middle of them all. With Beijing in the North - Shanghai in the East - Xian in the West - Hong Kong and Guangzhou in the South, Nanchang is surrounded by the larger cities of Wuxi - Hangzhou - Quailing and Shenzhen. Quite a few participants of our preceding China Playshops came from Nanchang. So it is not a surprise to me that we had six Level-2 and ten Level-3 returnee Playshop graduates amongst of our 67 participants. To start off my visit to Nanchang, I did a “Tithing” gig at the Zhou Yi Yao University for Chinese Medicine, Psychology and Music Therapist students. The university also has students who will become teachers in the Chinese educational system. We did a two hour lecture-demonstration drum circle with 300 university students from all of the categories listed above. Four of our drum circle facilitation students did an opening co-facilitated “Drum Call.” I used their drum call activity as a platform to deliver the technical aspects of how to facilitate a rhythm-based event in any type of population and age group. Then I did drum circle games and facilitated musical pieces in between educating them about the adaptability of rhythm-based events to meet the needs of those students chosen professions and the people whom they will be serving. 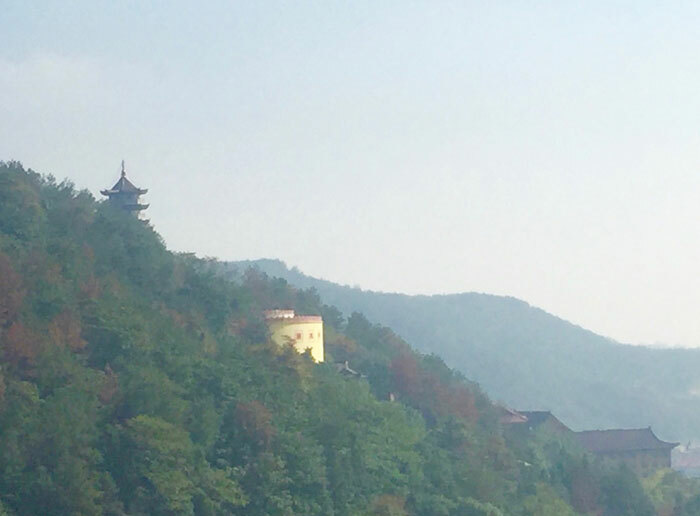 Nanchang is nestled up against a beautiful range of forested mountains sprinkled with fall colors. It seems that I have been chasing fall since I started this tour 2 months ago. We found a corporate venue hotel next to a waterfall that fell into a small mountain lake. The hotel is just the right size for us to fill up their rooms with our group of 67 Playshop participants, without us having to worry about upsetting any other guests with our 3 days of riotous drumming. This is the view from my hotel balcony of the Buddhist temple complex sitting across the canyon from us above the lake. Nanchang is also the home town of one of my major Chinese protégés and my friend, Wang Guofeng. 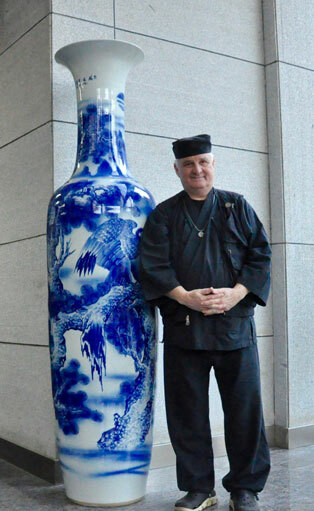 Whenever I travel, I tend to wear Japanese buddhist work clothing called Sumwe (take another look at the vase picture). Chocolate always wears a “Tang suit” which is traditional Chinese clothing. He has fully incorporated the meditative martial art, Tai Chi Chuan into his life, and into his facilitation style. Many people in China who are involved in the practice of Tai Chi, other martial arts, or are living a “traditional life” wear the cloth buttoned Tang suit. What is interesting, is that most of the Tang suits that Chocolate usually wears, are white, so I call him White Chocolate. Chocolate is the managing director of the Nanchang Kids Musical Care Center. He is a certified Music Therapist and certified Psychologist. The center works with special needs children using Psychology and Music Therapy. Chocolate’s Kids Care Center also contains an ORPH-school. Besides the work he does at the center, Chocolate does community drum circles and rhythm events throughout the region, while mentoring other VMC DCFacilitator students. As well as graduating from the VMC Beijing 6-day training this spring, Chocolate has attended at least nine of the many Playshops that I have taught in China so far. That means that I have been able watch him mature as a facilitator and an elder-in-training over the years. His community - group process and drum circle radar is BIG. It is nice to be in his town and see the great recreational community that he has helped build. The China Playshops are like no other in the Village Music Circle facilitator training system in the rest of the world. We designed a 3-level training system that meets this culture’s Learning - Advancement and - Certification system. With this multi-tiered training system in place, the Playshop facilitation information can be passed on and integrated at a more leisurely pace. These Chinese facilitator trainings have just enough experiential and cognitive information for the beginner facilitators (Level-1s), to be able get out into the world for a year, and make the mistakes that they need to make to learn and be successful. When they return to their Level-2 part of the Playshop the next year, they bring their experience back to the newer group of beginner facilitators, as models for the next step while using that experience for deeper learning, more experimentation and exploration. In a way, the Level-2s are equal to the returnee graduate Challenge participants that participate in the regular Playshop trainings outside of China, whom are challenging themselves at the edge of their knowledge and experience. So far, the right number of the Level-2s keep returning to their third Playshop to do the Level-3 training. Although a small percentage of Level-1s return the next year for their Level-2 experience, a much larger percentage of Level-2s return to the Playshop, after their one year experience out in the “Real World,” to become Level-3s. And a higher percentage of Level-3s just keep coming back time and time again to the Playshops. Like Chocolate - Panda - Yao - Boom - and Fox, (their Western names), this Playshop is not their first Level-3 experience. These are the people who are becoming the Elders-in-Training and mentors for the growing Chinese recreational drumming and rhythm care community in China. I am a proud Uncle. • Along with doing the Challenge program and advanced modeling for the Level-2s, the Level-3s help lead the breakouts and do a little supportive-mini-mentoring on the side. In this program, I am stretching the Level-3s radars from facilitating the circle to facilitating the Playshop training process. • One element of “mini-mentoring” that I give the Level-3 participants, is that during the “Freeform Jump-Time” exercises in the program, when a Level-1 or Level-2 participant has finished their two minute experimental facilitation “Jump” in the circle, they run out to where a Level-3 has been watching them and is waiting to give them a two minute feedback critique. • The Level-3s are now running the full 15-minute morning Drum Calls on their own. While one Level-3 does the drum call, another Level-3 scribes the facilitation interventions and then gives a public critique to the full group with “future pacing” educational elements embedded in the critique. • After each tea or lunch break, a Level-2 participant will do a 5-minute “freeform” drum call and gets a private critique from an assigned Level-3 person immediately afterwards. The Nanchang Playshop was a great way to finish off this years China tour. All 3-day China programs are held between 9AM to 5PM each day, which gives us plenty of hang out time in the evening. By all of us living together during the Playshop, community and camaraderie had fully formed by the middle of the second day. Because we were all staying together in an all-service corporate hotel venue, the ensemble learning consciousness jelled quickly, so we were able to cover more material than a usual 3-day Playshop. Because we are all living in one place, we had an opportunity to hold a great “Late-Night” drumming session at the end of the second day. We moved from our training room to outside onto the big hotel patio that overlooked the waterfall, stream and the lake. Our late-night session was mostly a full volume “Ya Ya” Grooves-party, mixed with overlapping traditional Chinese folk songs that everybody knew. Throw in a birthday cake, some fire crackers, a little hip-hop break dancing in the middle of the circle and you have a Chinese late-night session. What was supposed to be a one-hour groove, had turned into a full celebratory evening. I was teaching some sleepy, but happy Chinese on the next morning of day three. All of our China Playshop trainings have had student populations of a minimum of 65, up to 75 participants. So to create a family-friendly drum circle for our usual “Run The Map” closing event, all we have to do is have the Playshop students invite their family and their friends. We always pack the place. The Nanchang closing Community Drum Circle was no exception. I usually do the community circle Drum-Call and then hand the event over to the Playshop students for Run-The-Map jump time. But this time I had Chocolate coordinate and manage a co-facilitated Drum-Call with the Level-3s, while I strung up the ribbons and strings onto the “Tour Ball” that I had collected during our closing ceremonies. We had a full complement of Moms & Dads, Grandmas & Grandpas, and enough “random factor” kids running around the place to remind the Playshop students that the amazing orchestration ensemble that they created together over the last 3 days. This was the exception, not the rule, and that as facilitators going out in the Real World, they would spend the rest of their lives trying to re-create our 3-day experience, one drum circle at a time. Thanks to REMO for their continued support of these Village Music Circles rhythm-evangelist tours. Nearly everywhere I go, I have a full orchestra kit of REMO drums to use for the trainings and the drum circles. But this time, the full REMO kit that we used at the Nanchang Playshop was a combination of REMO drums contributed by five of the full time facilitators from this region who have their own Drum Circle Kits. What comes around - goes around. 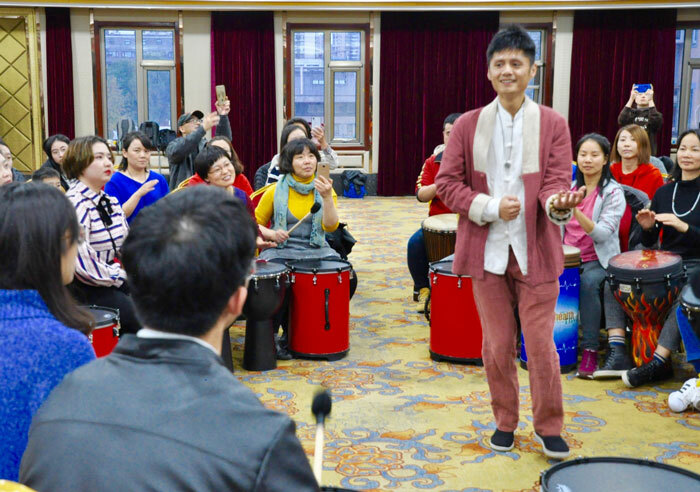 Tonny from KHS Music in Beijing, has determined that the China drum circle facilitation community is already ripe for it’s second 6-day Playshop program. So next year in May 2019, we will tack on another China 6-day Playshop, when I go over to Asia to do the first Kuala Lumpur, Malaysian 6-day Playshop as part of the Asia DCFAcilitators Conference. Then in November of 2019, I will return to China a second time to do another series of 3-day Playshops in Honcho - Quilin and two other cities. Going to China twice a year is getting to be a very nice habit. Now on to Dallas Texas and the American Music Therapy Association (AMTA) Conference.